Grain prices have been on the rise. So what? A cattle producer might ask. How will it impact me? It depends what sort of cattle are being produced, but if it’s feeder cattle, rising grain prices are not good news. Lotfeeders buy a large proportion of young cattle, and the other major input into a grainfed steer is obviously grain. The higher the grain price, the less money lotfeeders can pay for feeder cattle. Figure 1 shows that feeder cattle prices have historically had a strong relationship with feed barley prices, but we can also see how this relationship has shifted since 2015. As grain prices rise, feeder cattle prices fall. The trendline on figure 1 shows that from 2003-2015, on average, a $50 rise in grain prices would equate to a 4.5¢/kg lwt fall in the feeder cattle price. The trend became more pronounced at higher cattle prices after 2015. For the last 2.5 years a $50 rise in grain prices has, on average, equated to a 36¢/kg lwt fall in feeder cattle prices. Over the last month east coast wheat prices have rallied significantly. New crop APW wheat has rallied $30 over the last month, while feed barley is up by a similar amount. Figure 1 shows there is actually a reasonably wide range of values of feeder prices at any given grain price, and this is due to other fundmentals. Figure 2 shows how dire the move in grain prices might just be for lotfeeders. While many will have grain pre-purchased, those buying barley at current values, and paying 360¢/kg lwt for feeder cattle, are likely to be losing money. Fortunately for feeder producers, young cattle supply is at its tightest level for the year over the coming two months. This may support feeder prices in the short term, but in the long term, higher feed prices are likely to start to bite young cattle values. Grain prices have a negative relationship with feeder cattle prices. 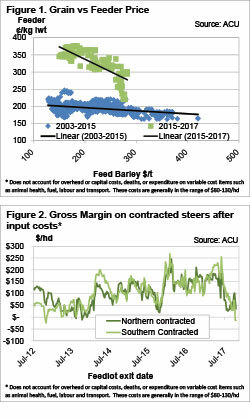 The strong rise in grain prices is likely to have pushed lotfeeder margins into the red. Feeder cattle prices need to fall 30-40¢ to counteract the rise in grain prices. If grain prices and grainfed cattle prices remain around current levels, what price do lotfeeders need? On figure 2, lotfeeders need about $80-100/hd to break-even after overheads. The good news is it’s not a disaster. If feeder cattle prices fall to 330-340¢/kg lwt, it will be enough to see lotfeeders move back into the black. On the upside, cattle producers growing heavy steers might actually find some support for finished cattle prices. Rising costs of production of grainfed beef generally tighten the supply of finished cattle, and push prices higher. 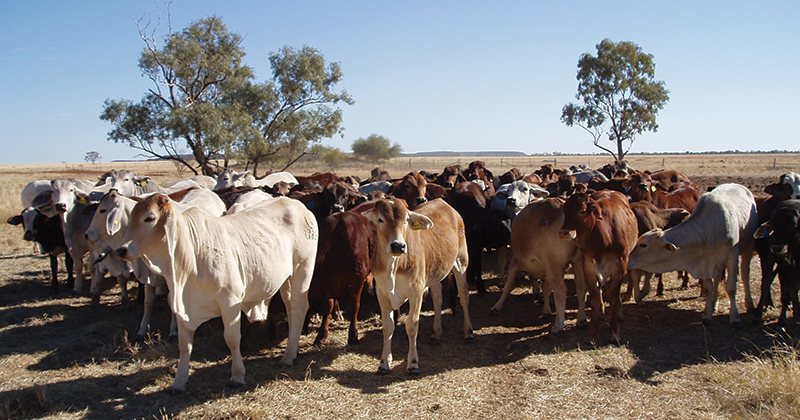 Additionally, the decrease in the price of finished cattle, is unlikely to be reflected in the price of finished cattle, if it is due to grain price rises.